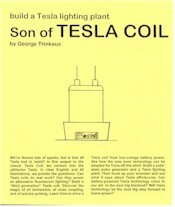 This is a solid-state Tesla coil construction manual. Instructions are given for building a solid-state version of Tesla's high frequency lighting oscillator design as shown in Experiments With Alternate Currents of High Potential and High Frequency. Pulse-generator circuits are provided for both the 555 timer and 4584 hex Schmitt trigger integrated circuits, incorporating a 4429 High Speed CMOS Driver and a single IRF 640 Power MOSFET.